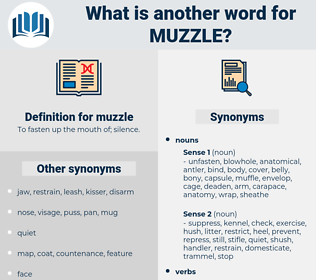 What is another word for muzzle? To fasten up the mouth of; silence. assist, free, permit, encourage, let go, help, release, liberate, allow, aid. And Landis slowly allowed the muzzle of his own gun to sink. If the king will have our young lord Josceline to keep in his hand so that he may thereby muzzle his father, why, he is king. 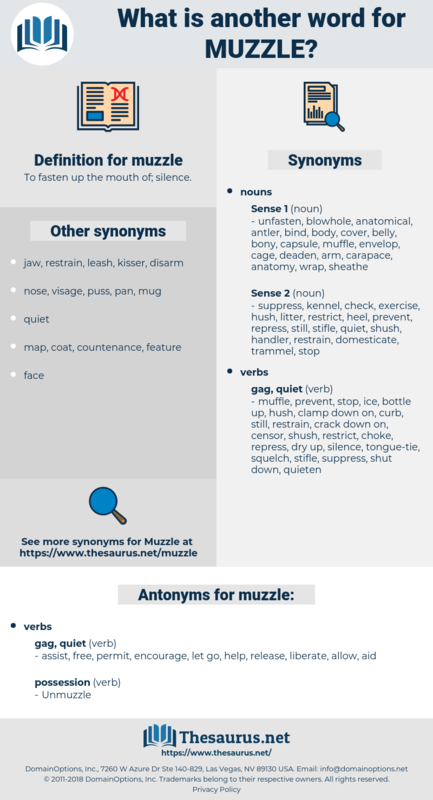 musical, megacycle, mizzle, mingle, mawkishly, meekly, mongol, minuscule, mew gull, music hall, monocycle, monocle, micelle, megachile, maxilla, maniacal, magical, Megillah, missile, macaulay, magically, mamoncillo, mongolia, moghul, miscall, muckhill, mess hall, mackle, mezcal, missal, musial, maxwell, mainsail, mugil, mecholyl, mescal, mensal, macleaya, moselle, makalu, moon shell, missoula, mokulu, misally, messily, macula, monongahela, majuscule, mickle, macushla, Mock Azalia, moonshell, muscle, manacle, muesli, measly, muckle, mucosal, mccauley, mussel, mesial, mogul, musically, music school, mosul, Mukalla, meningeal, Minke Whale, mangle, miniscule, michael, mosaic law, mexicali, mislay, meningocele, macule, Mohs Scale, monomaniacal. outfit, equip, fit, fit out.